WASHINGTON, D.C. – February 11, 2018 – FranConnect, the leading provider of franchise management software, announced today that new market research confirms their customers grew 44% faster than the broader franchising market. These results follow on FranConnect’s strategic decision years ago to be hyper-focused on helping its customers grow their businesses. Strong unit growth and superior unit economics are core tenants of the Company’s value proposition. Visit Us at the IFA Convention! We're packing our bags for IFA 2018! We can't wait to visit with our awesome customers and to connect with new franchisors. If you are headed to Phoenix, we'd love to meet with you! 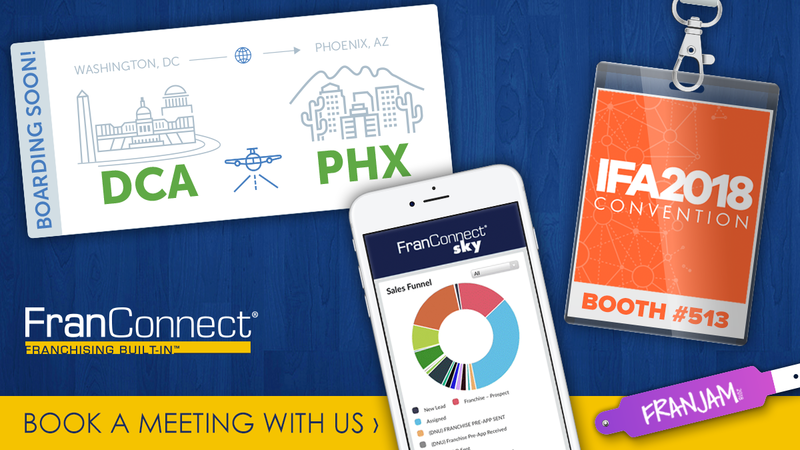 Swing by Booth #513 to check out FranConnect Where You Work™. We've extended the power of our platform to your favorite business applications like Gmail and Outlook to make it even easier to manage your business — in fact, you can even autopopulate records in FranConnect Sky without ever logging in!